Tho', I really don't use it all that often. Maybe I just haven't figured the right usage scenario... maybe because tags are usually not super accessible. Well, this new kickstarter program might help to keep your NFC tag close at hand... hand... get it? 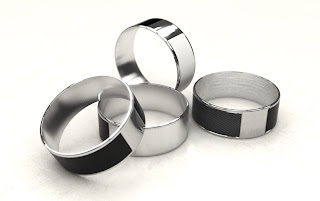 Very cool concept, an NFC 'tag' embedded in a ring band. And from the videos it shows that there's 2 'sides' to the ring, essentially 2 tags. A 'public' and 'private' tag. I'm intrigued enough. £22 for the ring and app, whereas for £3 more you can get a 'special designed' one (there'll run a contest for the design at some point). One of the concerns I've heard is what if you use your phone with that hand? Would it just be constantly 'scanning' the tag? I guess it depends on where the antenna is in your phone? I just tested by putting a tag on my finger near my ring and held it behind my phone. My 'sweetspot' is up near the camera, and I don't often hold my phone that high. So you should probably be safe. Mayhaps this could be a cool anniversary gift?!? !